Imagine you had a robot butler or maid to do all your dirty, repetitive chores, freeing you up to do more of what you love. That’s exactly what recruiting chatbots promise to be for recruiters: a solution that takes care of the most boring, tedious parts of the job, like sourcing, screening applicants, and scheduling interviews. 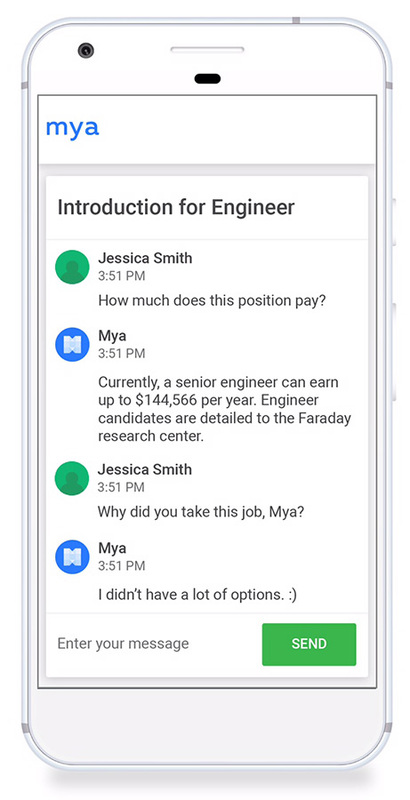 Communicating with candidates in one-on-one, instant messaging conversations on platforms like Facebook Messenger and text messages, chatbots can ask candidates about their experience, answer common questions, and collect all kinds of info and inquiries for a human recruiter to review. 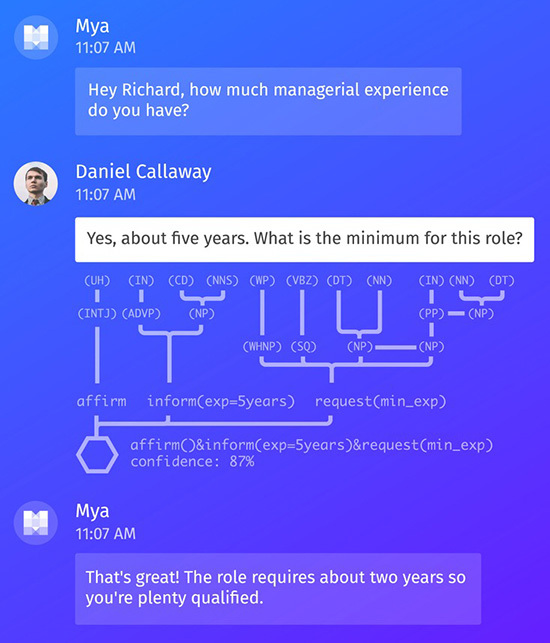 To learn more about what these robot helpers can do and how they’ll shape the future of recruiting, we sat down with the CEOs of two recruiting chatbot companies—Luc Dudler of Job Pal and Eyal Grayevsky of Mya Systems. Read on to see where recruiting chatbots excel, where they fall short, how they can make recruiters’ lives easier, and what real recruiters think about using them. Chatbots aren’t new: I remember chatting with SmarterChild on AOL Instant Messenger back in 2001. But they’ve generated a ton of excitement and buzz in the last couple years. That’s because now they’re actually smart enough to be pretty useful. In Silicon Valley, artificial intelligence (AI) and natural language processing (NLP) are all the rage right now. And it’s not just consumer-friendly “virtual assistants” like Siri, Alexa, and Cortana: other AI-fueled robots are invading almost every industry—including recruiting. Mya, for instance, recently raised over $11 million in funding. Today’s recruiting chatbots can do a lot. They can parse resumes and ask for clarifications. They can also answer basic questions and even make sarcastic quips. Chatbots can complement or even replace your traditional application form, interacting with candidates immediately to get their experience and qualifications. For example, rather than filling out a lengthy application form, chatbots can prompt candidates for the same information in the form of a user-friendly text-based conversation. 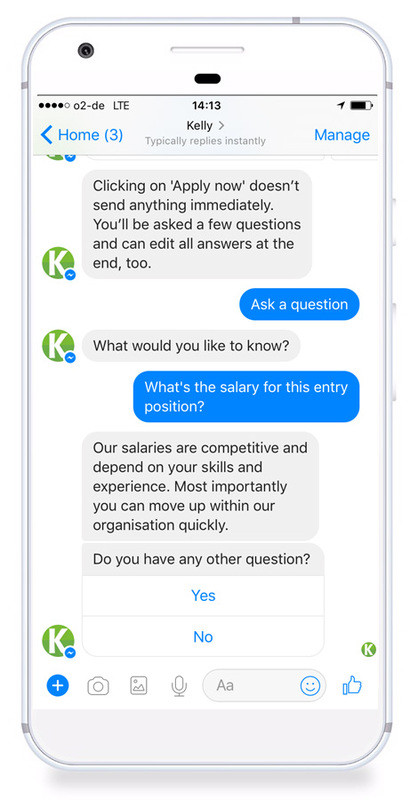 And while up to 74% of candidates drop out after starting the application process, chatbots can actively remind them to finish answering questions and collect incomplete information, unlike a static application form. After the first contact, bots can provide status updates, schedule an interview, or even reject candidates. 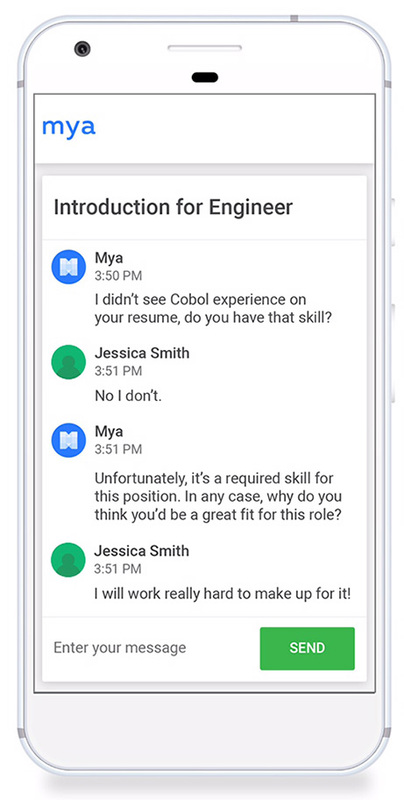 To get a deeper sense of how candidates might interact with chatbots, check out this candidate experience journey created by KellyOCG, a staffing consultancy client of Job Pal. The most obvious challenge that chatbots solve is one that’s all too familiar to recruiters and candidates alike: that uncomfortable radio silence between submitting a resume and hearing back about next steps. While your most valuable skills as a recruiter relate to your judgment, outreach, and personality, much of your day is spent doing mechanical tasks like scheduling interviews and sorting through resumes. While some recruiters might first fear a robot takeover, many find that it actually allows them to focus on the most interesting parts of their job. Indeed, a recent survey of recruiters shows that more than 80% believe sourcing and pre-employment tests should be automated. That echoes the experience of the HR team at hub:raum, an incubator powered by Deutsche Telekom AG that’s also been using Job Pal’s chatbots. That’s not to say it’s all perfect. Some candidates might be tripped up by the chatbot: “Candidates who aren’t used to communicating via chat and expect a human might experience gaps in their candidate experience,” say Tim. And while chatbots might make recruiters’ lives easier and delight some candidates, there’s also a risk that it could turn other candidates off. A recent survey of job seekers also shows the 82% say they’re often frustrated by an overly automated experience, and 87% agree technology has made the job search process more impersonal. Still, chatbots grow smarter every day—and as consumers get used to virtual assistants like Siri, Alexa, and Google Now, they may become more and more comfortable interacting with bots. 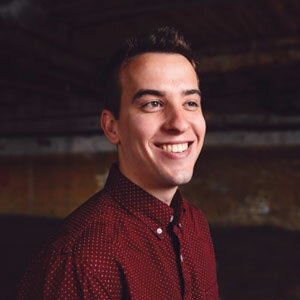 Luc of Job Pal has found that candidates are eager to interact with their chatbots. While many chatbots run through a series of standard, scripted questions (in effect, serving as a form that candidates fill out via instant messaging), many users treat chatbots like real conversation partners—going off-script and asking the bots organic questions. Chatbots might be a novelty today, but watch out: in a few years, they might be the new standard.